We’d love your help. Let us know what’s wrong with this preview of Pocket History of the United States by Henry Steele Commager. "A Pocket History of the United States" traces the history of the nation that is, today, the oldest constitutional democracy in the world. Written by distinguished American historians, it has more than 2,000,000 copies in print worldwide and is one of the classic works in its field. To ask other readers questions about Pocket History of the United States, please sign up. Hi. how could i get book within Pakistan? ABD Tarihini genel hatlarıyla ele alan kitapta, ABD tarihindeki en temel kavramları ve olayları kısa bilgilerle biraz da roman tarzında edebi bir anlatımla öğrenebilirsiniz. Önsözünden anlaşıldığı üzere; tarafsızlık, bilimsellik ve ciddilik yönünde bir iddiası bulunmayan kitabın dipnotlama vs. de yapmaması tarih okumalarındaki soğuk üsluptan bıkanlara ilaç gibi gelebilir. Her ne kadar kapağında bir yerli tasviri olsa da kitap kolonileşmeyle başladığından yerlilerle ilgili bilgi çok azdır. ABD tar ABD Tarihini genel hatlarıyla ele alan kitapta, ABD tarihindeki en temel kavramları ve olayları kısa bilgilerle biraz da roman tarzında edebi bir anlatımla öğrenebilirsiniz. Turkish version of this book was translated and commented by famous earlier Ottoman historian Halil Inalcik. This book is one the best reading choices i've made in a long while. I had not read any American history since i was in high school, and i could not have cared less about it then (sorry H.S. teachers, it was not your fault). Re-reading history as a grown adult is a whole different experience. The relevance of persons, events and policies is much clearer after living the majority of your adult life interacting with the results and consequences of them. I have come up with a list of presidents i w This book is one the best reading choices i've made in a long while. I had not read any American history since i was in high school, and i could not have cared less about it then (sorry H.S. teachers, it was not your fault). Re-reading history as a grown adult is a whole different experience. The relevance of persons, events and policies is much clearer after living the majority of your adult life interacting with the results and consequences of them. I have come up with a list of presidents i want to read more about: Jefferson, Wilson, FDR. And as dysfunctional as things seem at this moment of our history, i have learned that we have been there before and somehow survived. Therefore, i come away with a sense of hope that somehow, once again, the American spirit that created this amalgamation of peoples will show the path out of this, yet another, dark chapter in our history. Moving on from this book, i'll read Howard Zinn's classic "A People's History of the United States" next, then some books related to my favorite president list. Here's hoping we are not too far gone to survive. Ever wonder how United States of America, came to what mighty world power it is now? Henry Steele Commager takes you to journey right from the birth of nation. From the very day the first person landed in the New World! The journey is full of surprises and encompasses Human Imagination along with feats of glory! How the deep rooted principles of Justice and Pursuit of Happiness came to be the essential part of the American Dream. What unites the people in USA and how they progressed to great hei Ever wonder how United States of America, came to what mighty world power it is now? Henry Steele Commager takes you to journey right from the birth of nation. From the very day the first person landed in the New World! The journey is full of surprises and encompasses Human Imagination along with feats of glory! How the deep rooted principles of Justice and Pursuit of Happiness came to be the essential part of the American Dream. What unites the people in USA and how they progressed to great heights. This book tells you all! To understand the Socio Economic Dynamics of USA this book is just the start you are looking for. Well written and well quoted. This book is a journey every person, who wants to understand Nation building must read. 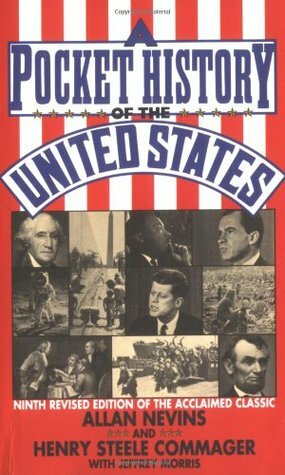 It is the complete essential History of United States of America. This is a great wrap up of the American History from 1776 to the 1960's. It gives you a brief summary of the events in the perspctive of a historian. It also shows you the different perspectives of the different sides of the conflicts. I reallly enjoyed the book for all of the information packed into such a samll looking book. I found it really practical to any student. I recommend this to any student. Kitabın bütüncül bir şekilde ABD tarihini vermesi güzel ancak bazı bölümlerde fazlaca yanlı yorumların bulunması beni biraz rahatsız etti. This is a one volume history of the United States from the colonial period up through the 1980 Presidential elections as written by two distinguished mainstream historians. If you want a summation of American history in under 700 pages, then this is the book for you. Includes a sixteen page list of suggested books for further reading. Exactly as the title suggests, this is a very compact history of our great country. It would be a great resource for anyone taking a general American history course. By Allan Nevins, Henry Steele Commager and Jeffrey Morris. History of our great nation in paperback form. My copy is tattered and torn from wear and tear. A good reference book. Easy to tote around. i immediately forgot everything i learned from this book. One of my high school books. Alongside Bailey's 「The American Pageant,」this book played a major educational role throughout my undergraduate years. I wish I knew where I last placed it. After a couple of blatantly racist chapters--in which the authors are thankful for the fact that the "savages" are not very smart--this book picks up. In fact, I learned quite a bit. Super. Très complet. Je le recommande à tous les étudiants en anglais. Henry Steele Commager was an American historian who helped define Modern liberalism in the United States for two generations through his 40 books and 700 essays and reviews.